The Rhode Island Genealogical Society donated a computer to the West Warwick Public Library containing the Rhode Island Cemetery Database. Currently, the database contains 470,000 gravestone records, 55,000 of which are accompanied by photographs of the gravestone itself. Patrons will be able to search for individual records and print or save a report for an entire cemetery. The North Burial Ground report is over 19,000 pages - luckily, patrons can save the reports to a flash drive to take home and browse at their convenience. "The library is very happy to receive such a valuable re source and thanks the Rhode Island Genealogical Society for their continued support. The database will doubtless be an aid to many researchers of family history. It is truly a boon to the community and to the library." 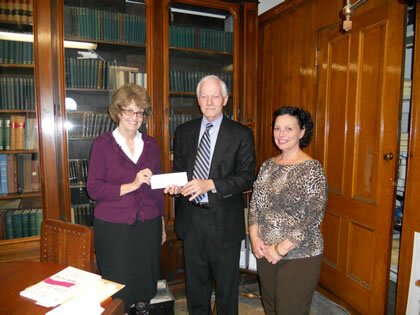 Cherry Bamberg (left) presents City Archivist Paul Campbell and City Clerk Anna Stetson with a check for $1,000. Cherry Bamberg, co-editor of Rhode Island Roots, a quarterly journal published by the Rhode Island Genealogical Society, arrived at the Providence City Archives with a check today for $1,000 to help with the restoration of Providence Town Council and Town Meeting records that date from the Revolutionary War period. The donation by the Genealogical Society will allow a professional bookbinder to repair torn pages, resew the books' signatures, and rebind the books in leather. Bamberg cited Archivist's Paul Campbell's knowledge and enthusiasm as an important factor in the society's decision to contribute to the effort. "The City Archives holds a vast amount of valuable historical records and I am drawn back there time and again to do my research," Bamberg said. "There is so much here, once you see the actual records you want to come back for more." Archivist Paul Campbell stated that with limited city resources, "this very generous contribution will allow these irreplaceable records to be preserved for use by future generations of researchers. This gift by the Genealogical Society encourages us to work even harder to serve those who visit us and redouble our effort to protect these valuable records." Bamberg also said that many of her colleagues are excited about the improvements at the City Archives. For those who are unaware, the Rhode Island Genealogical Society is not a historical society. It is a group that conducts regular meetings throughout the state to promote genealogical research and members contribute articles to their quarterly journal, Rhode Island Roots. Some of the six hundred or so members are even from foreign countries. Established in 1975, the members continue to find much of their information from archival records and would not be able to create their family trees without them. The City Archives is located on the fifth floor of City Hall at 25 Dorrance Street in Providence. Hours are from 8:30 a.m. to 4:30 p.m. Monday through Friday. The nearly 40,000 cubic feet of records provide researchers a variety of information that span the period from 1636 to the present day. For more information contact archivist Paul Campbell at (401) 421-7740 ext. 558. You can also send an e-mail to archivist@providenceri.com. At their meeting in Annapolis, Maryland, on 1 November 2008, the American Society of Genealogists voted to give their annual Donald Lines Jacobus Award to Wayne G. Tillinghast for his book, The Tillinghasts in America, The First Four Generations. Published in 2006 by the Rhode Island Genealogical Society (www.rigensoc.org ), this work is a classic genealogy, tracing the descendants, both male and female, of Elder Pardon Tillinghast (ca. 1622–1718), who settled at Providence in or before 1645. Despite the subtitle of the book, many descendants in the fifth and sixth generations are treated. Intermarriages with other Rhode Island families make this genealogy almost a Who's Who of colonial Providence. Thoroughly documented, extensive biographical detail includes much Rhode Island history and corrects previous errors. As noted in a review in The New England Historical and Genealogical Register (161 :73), "The discussion of difficult problems is impressive." Mr. Tillinghast graduated with honors from the University of Connecticut School of Law, and practices in Norwich, Connecticut. He has authored several historical and genealogical articles for legal publications as well as for Rhode Island Roots. The Donald Lines Jacobus Award was established in 1972 to encourage sound scholarship in genealogical writing. It is presented to a model genealogical work published within the previous five years. A list of the books receiving the award in previous years appears on the American Society of Genealogists website (www.fasg.org ). Anyone planning to publish one's own research, especially as a compiled genealogy or family history, would do well to study the format and style of these books.